Note: An Active Learning Classroom – or ALC – is the phrase used to describe a student-centered, technology-rich learning environment that typically features tables with places for four to nine students, hook ups and screens for projection from student laptops, table-specific white boards, microphones at tables in larger classrooms, and a teaching station that allows instructors to select and display table-specific information. The photo at above depicts an ALC classroom. Active learning classrooms can elicit a continuum of responses from students who take classes in them. As in instructor in these spaces, I have heard students say they were looking forward to working in this new space and students who grumbled about the space as distracting or a “waste of money” for its multiple technology elements. In working with faculty teaching in these rooms, I also know that instructors use the rooms in very different ways – some taking full advantage of the technology and the space, others using just the main projection screen to support a traditional lecture. Participants in the February Pedagogical Innovations Journal Club related similar experiences with students and faculty as we met to discuss the article “Conceptions of Effective Teaching and Perceived Use of Computer Technologies in Active Learning Classrooms” by Gebre, Saroyan, and Aulls, from a 2015 issue of the International Journal of Teaching and Learning in Higher Education. What are instructors’ conceptions of teaching? How are these conceptions of teaching related to their use of computers in their course taught in an active learning classroom? Focuses on what the teacher does and making the subject clear to students. Focuses on engaging students with the course material and each other. Focuses on what the student does and developing learning independence and metacognitive awareness. Based on data gathered, the authors grouped instructors’ expected student learning outcomes into three general categories, which also align with their views of effective teaching. For instructors who defined effective teaching as teacher centered, the learning expectations featured knowledge about and understanding of the subject. For instructors defining effective teaching as engagement centered, the outcomes addressed solving exercises using models. For instructors who defined effective teaching as learning and development centered, outcomes engaged students in building models, approaching and solving problems. – e.g. lecturing for those instructors whose learning outcomes were subject matter understanding and application. – e.g. group exercises and discussions for those instructors whose learning outcomes were skills development. – e.g. students work on their own projects for those instructors whose learning outcomes focused on learning independence. This type of use, which featured use of PowerPoint, was by the teacher-centered instructors that taught mainly by lecturing. In this category, discipline specific software for data analysis and modeling was employed by a subset of instructors in the engaging-students category. This type of non-use – in which round tables, for example, were preferred over computers – was employed by a subset of the instructors in the engaging- students category. This choice of technology use – for example, incorporation of webquests that use student-chosen internet content – was employed by the instructors in the developing-learning-independence category. In the classrooms of instructors who transmit knowledge, 55% of students indicated that that their professors had a high use of computers while the remaining 45% indicated their professors had a low or medium use of computers. Compare this to the results from the engaging-students and developing-independence classrooms where 82% and 86% respectively of students reported high use of computers by their instructors. In terms of their own use of computers in the classroom, the following data indicates that, for the most part, in the transmitting knowledge classrooms, instructors were using computers, but students were not. the remaining 75% in these classrooms indicated they had a low or medium use of computers. Compare this to the results from the engaging-students and developing-independence classrooms where 75% and 82% of students, respectively, reported high use of computers by their instructors. This indicates that students in these classrooms were using computers at about the same rate as their instructors. These general results may explain the variety of responses from students we have heard and the variety of instructional strategies employed by instructors in the classroom that we have observed. If definitions of effective teaching influence student outcomes and teaching approaches, it makes sense that it would also influence the use of technology in the classroom (see Table for a summary). Thus the differences we see in technology use in active learning classrooms may simply reflect the differences in what instructors believe constitutes effective instruction. A final question asked of students was to compare their predicted learning if this class had been taught in a traditional classroom. While the majority of students in all classes indicated that their learning would be less in a traditional classroom, the percentage of students who said so varied between the three categories. 43% of students in the lecture classrooms indicated that their learning would be the same or better in a traditional classroom. Compare that to 27% and 8% who said the same for their learning in the skill development and learning and development centered classes. Active learning classrooms are designed to encourage student collaboration and technology use. Thus it is no surprise that students in the classrooms of teachers who actively use these spaces recognize the value of that space for their learning when compared to a traditional classroom. Relatedly, the use of technology may not be critical or even necessary for students in classrooms emphasizing information transfer, as described in this article. Active learning classrooms are not ideally designed for information transmission, in part because there is no clear focal point and direct line of site for all students viewing the large projection screen. Students will recognize this and it may partially explain their negative attitudes about the technology in the space we have observed. Therefore, it seems more appropriate for instructors who will be using information transmission as their main form of teaching to use more traditional classrooms that are better suited to this form of teaching. 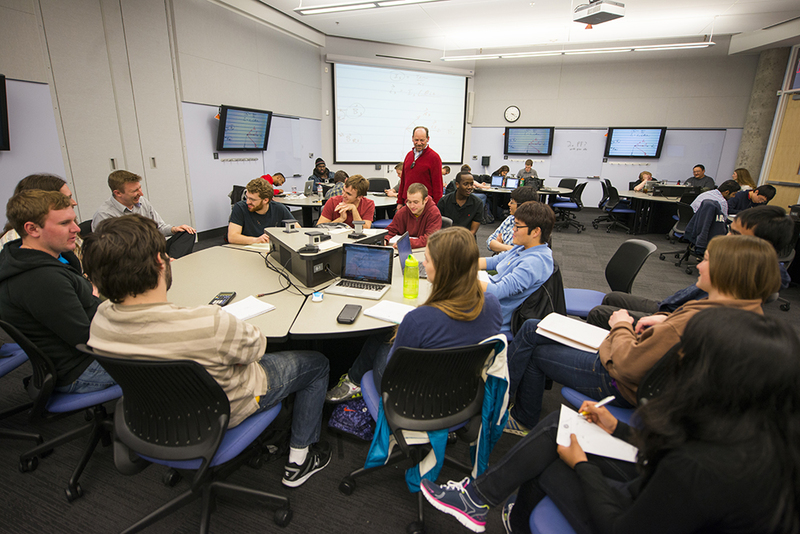 For instructors who use strategies that support student engagement or learning independence, the active learning classroom may be an ideal environment for their teaching approaches. If you are interested in articulating your own definitions of effective teaching you can take the Teaching Perspectives Inventory. The results describe five different categories, some of which correlate with the categories described in this paper. Citation: Gebre, Engida, Alenoush Saroyan, and Mark W. Aulls. “Conceptions of Effective Teaching and Perceived Use of Computer Technologies in Active Learning Classrooms.” International Journal of Teaching and Learning in Higher Education 27.2 (2015): 204-220.